Mohamed Selim Al Awa - Who is Mohamed Al Awa? Who is Mohamed Selim Al Awa? After the exclusion of the famous and popular Salafi candidate Hazem Abu Ismail, Selim Al Awa is now vying with Abou El Fotouh and Morsy for the Islamist vote. The Salafist Nour Party, which surprised all by winning 25% of seats in the new Parliament, has named Selim Al Awa as one of the possible candidates it will choose to endorse. 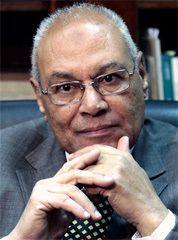 According to one source, however, Abu Ismail’s supporters are more likely to back Abouel Fotouh.